This is a great recipe for a quick and simple lunch complimented by a couple of glasses of Portuguese white wine. 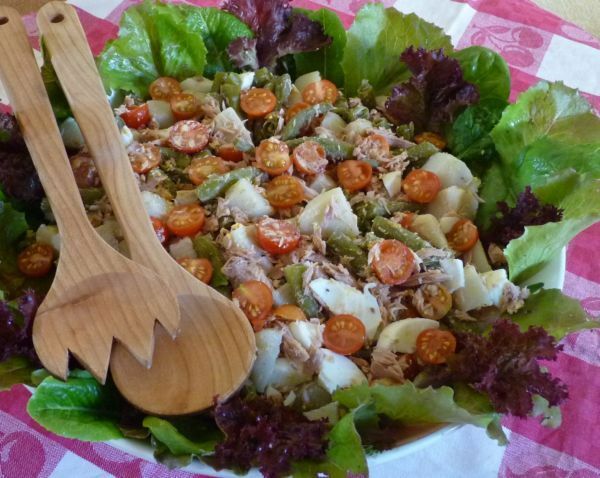 I was originally told this recipe was called Salad Nicoise but I have since been informed (after a heated debate with some French friends, from Nice) that it’s not! Authentic Salad Nicoise apparently does not include green beans. Tip – Make sure you cook the beans and potatoes well in advance as they need to cool before adding to the salad. Cold new potatoes cut to about 1.5cms square. – Mix all the remaining ingredients together (except the baby salad leaves) and place in the salad dish. – Decorate with lettuce leaves as shown in the picture above. – Cover, and refrigerate until ready to serve. Serve with either your own dressing or cheat (ssshhh) and use a ready made one! hmm looks nice, but looks as if it has too much egg in it for me! Hate egg! As for the Nicoise bit of the salad, I have family who lived in Nice for a long while so I asked them too. Traditionally the true recipe doesn’t have green beans, but as many things, it has evolved over time so in a lot of restaurants and places now you will get green beans with it. At the end of the day it doesn’t really matter, I think I prefer Piglet’s Portuguese Salad anyway (with less egg of course!). It’s certainly a versatile recipe! This looks wonderful, but I’m totally ignorant: what dressing goes best with this type of starchalicious salad? What do YOU put on this salad?